The patient has been experiencing right knee pain when she bends it for the past week. There was no specific cause or event that initiated the pain. (We should always ask if the patients had similar symptoms in the past, what is their living environment like, and if they have had any externally contracted diseases.) Walking and certain postures aggravate the pain. 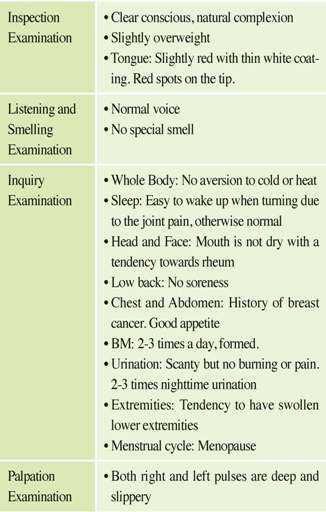 (We should have the patients describe which kinds of postures aggravate the pain.) Her knee joint is slightly swollen, but it is not red. However, it is slightly hot behind the knee. Patric’s test (-). An audible clicking sound can be heard com­ing from the patella (+). There is no pain when she sleeps but it hurts when she turns. Her heel is sore and achy. There is no history of external injury. 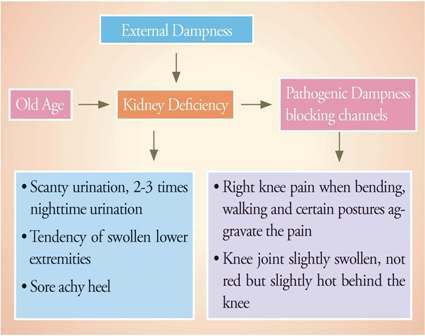 a) Etiology: Knee Bi caused by kidney deficiency and dampness blocking the channels. d) Condition of Disease: Right knee pain for one week when bending it. Walking and certain postures aggravate the pain. It is a condition categorized as Bi Syndrome. The patient has had the pain for only one week, it’s in­cipient. Her knee joint is slightly swollen, not red, but slightly hot behind the knee. The pain occurs when she is bending the joint and it is localized. The swelling of the knee joint, the inhibited bending and stretching, and the slippery pulse all indicate pathogenic dampness. The slight heat behind the joint indicates heat but it is not abundant. The patient is over 60 years-old, urinates 2-3 times during the night, and has sore achy heels. There­fore, we can assume that she has kidney deficiency. The scanty urination, urinating 2-3 times during the night, and the tendency of swollen lower extremities indicate bad water metabolism. It could be due to kidney defi­ciency unable to warm and transform the water, which leads to flooding and overflowing of pathogenic water to the fleshy exterior, causing the swollen lower extremities and scanty urination. e) Pattern Identification - Knee Bi: The branch is damp­ness evil blocking the channels with slight heat; the root is the kidney deficiency. Treatment Method - In an acute situation, focus on the branch: The primary focus is to dispel dampness and circulate the channels. This is supplemented by tonifying the kidney. f) Prescription: Four Marvel Pill (Si Miao Wan) and Achy­ranthes & Plantago Formula (Ji Sheng Shen Qi Wan).